The universe has many monstrous black holes, and researchers aren't typically surprised when they find one. However, a team of astronomers led by Chung-Pei Ma of the University of California-Berkeley recently stumbled upon one in a very unexpected place – the galactic equivalent of a small town. 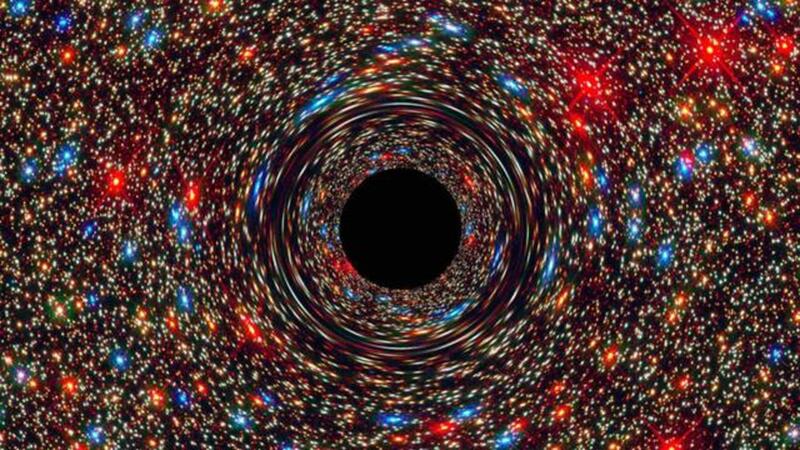 Behemoth black holes most often reside in the more expansive and densely populated regions of space. The new mega black hole, which, incidentally, weighs the equivalent of roughly 17 billion suns, is situated in a fairly large galaxy. Yet, the surrounding cluster is alarmingly sparse. Ma commented, "...the question now is, 'Is this the tip of an iceberg?' Maybe there are more monster black holes out there that don't live in a skyscraper in Manhattan, but in a tall building somewhere in the Midwestern plains." The astronomers believe the now enormous single black hole may once have been two separate entities that merged over time.